Ever had a day where the weather was so beautiful, so perfect, you wanted to just freeze time forever? We’ve had several days like that around here recently. 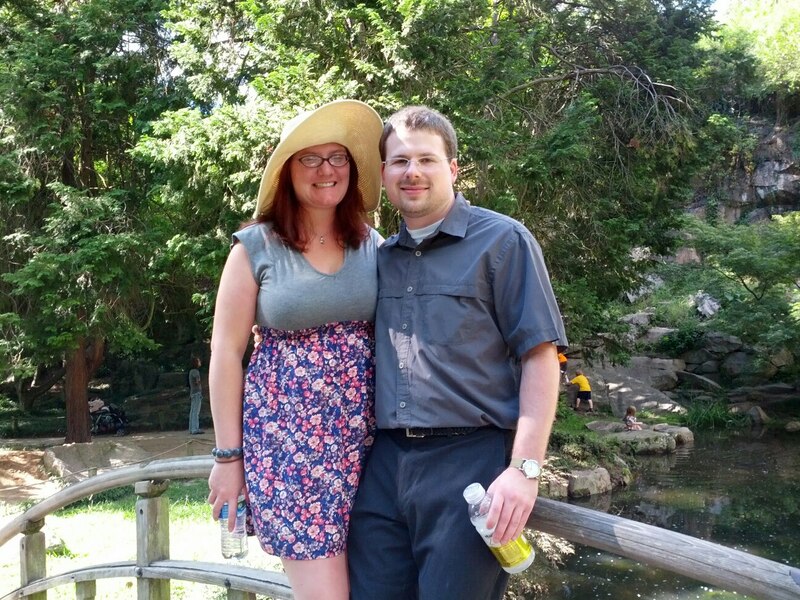 This past weekend I couldn’t wait to visit one of my favorite places, Maymont Park. Nothing relaxes me more than taking a stroll through that park. Hundreds of acres of rolling hills, farm animals, trails and more. They even have bears and a waterfall nestled on the grounds! 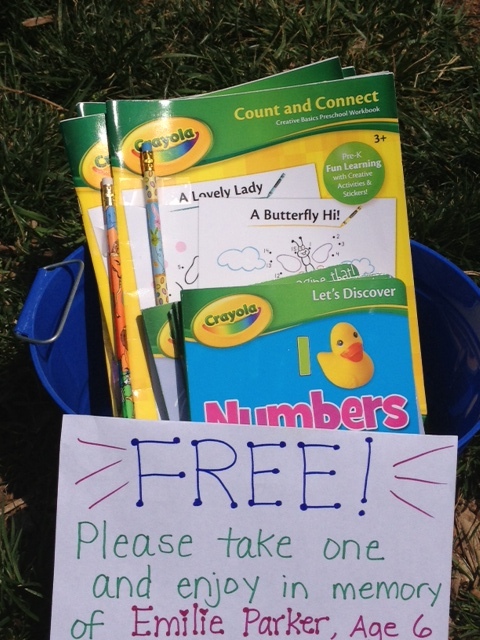 I decided to do another random act of kindness by gathering some activity books and pencils I had been saving from a Target clearance sale a few months ago. I thought again of those precious lives lost at Sandy Hook and one little face popped into my mind. Emilie. A sweet blond headed cherub who shared the same name as my sister, although spelled a different way. I remembered reading about her, how she loved anything to do with art, especially making handmade cards. That, of course, made me think of my own daughter who started her own card making business at the age of 13. Without a moment’s hesitation, I knew today’s RAK would be dedicated to Emilie. 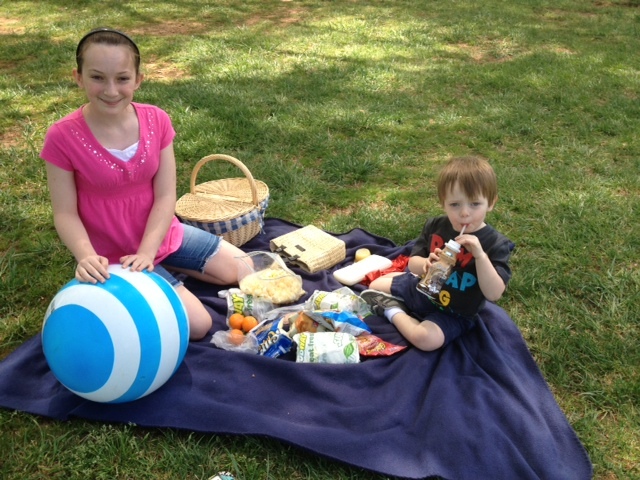 We gathered our things to have a picnic at the park then headed towards Maymont. Traffic was light, the breeze was blowing… I could not have asked for a more beautiful day. Upon our arrival, we found a nice, shady spot to set up our picnic lunch, near the iron statues of children playing on a wooden log. 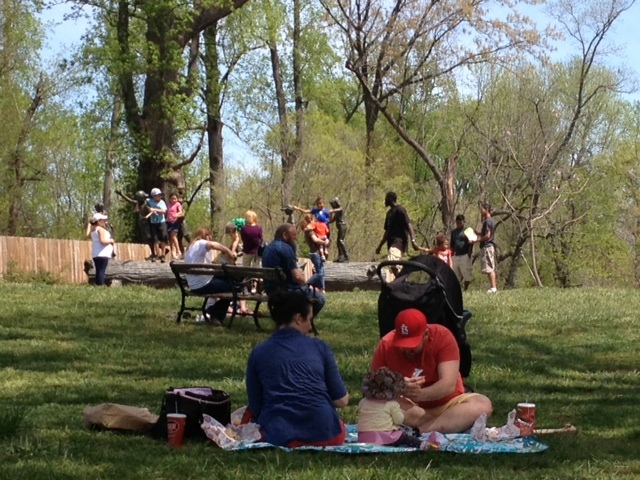 It was a busy day in the park with many families enjoying the gorgeous weather. As I made my way towards the statue, I knew it would be a perfect place to leave my bucket of activity books as children were always climbing and playing in that spot. All of a sudden it was if a magnet was placed on the side of that statue. Children, parents, even a few grandparents made their way to see what all the fuss was about. We simply sat on our blanket and watched with glee, imagining how Emilie would feel to know her RAK brought so much joy to others. I broke my trance for a moment and captured a photo of a dad flipping through one of the books with his son (see below). Simply precious! Then, as our picnic was winding down with full bellies and happy hearts, I saw a family of three approaching our blanket. Lo and behold, it was my sister, Emily! I couldn’t believe it! I had no idea she would be at Maymont that day and she was just as surprised to see me. But I treasured the surprise (a.k.a. divine intervention and perfect timing) and spent the next few hours soaking up the rays of sisterhood as we walked the park together with our families. With the acts of terror, violence, and despair we have experienced in only four days since our picnic (Boston marathon bombing, ricin laced letters to government officials, explosion at the Texas plant, even a scrawled hate message on a high school bathroom door in a neighboring school district), it makes me once again dig deeper to share peace and joy. I know my simple acts of kindness may not change the landscape of hatred that fights to cover our nation and our world, but I still believe with all my heart that even one random act of kindness can change a life forever. Who am I to decide which life is changed? I simply act on the whispers of my heart. 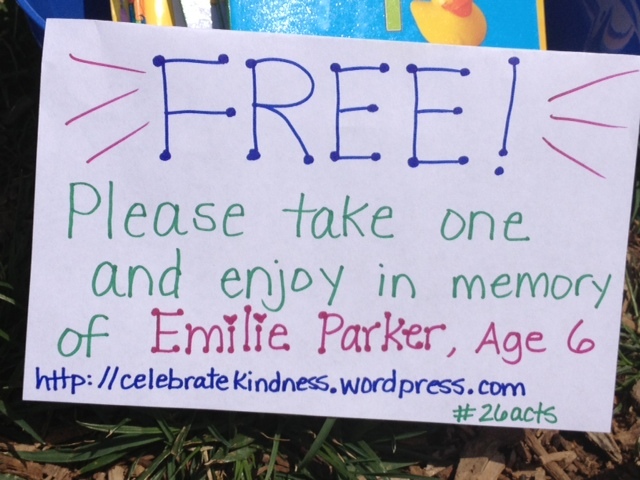 This act of kindness is dedicated to Emilie Parker, age 6. May her family find comfort in knowing her legacy lives on in others. Timing is everything. 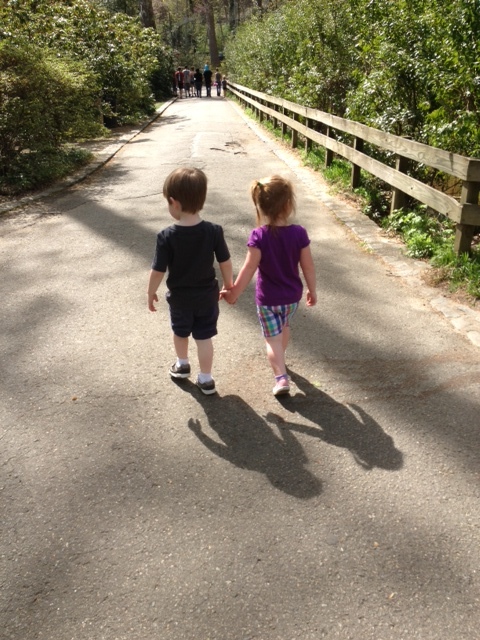 Last weekend, I decided to take my kids to Maymont Park to enjoy the beautiful weather. 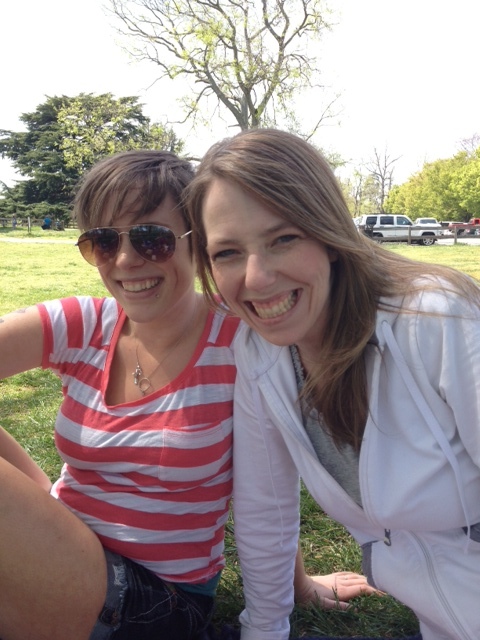 We were in no rush to get ready, nor were we on any sort of timeline to leave the house (or arrive at the park.) We definitely enjoyed the laziness of the day! Before heading to the park, we stopped at Target and got caught up in the 70% off clearance sale racks by the entrance of the store. 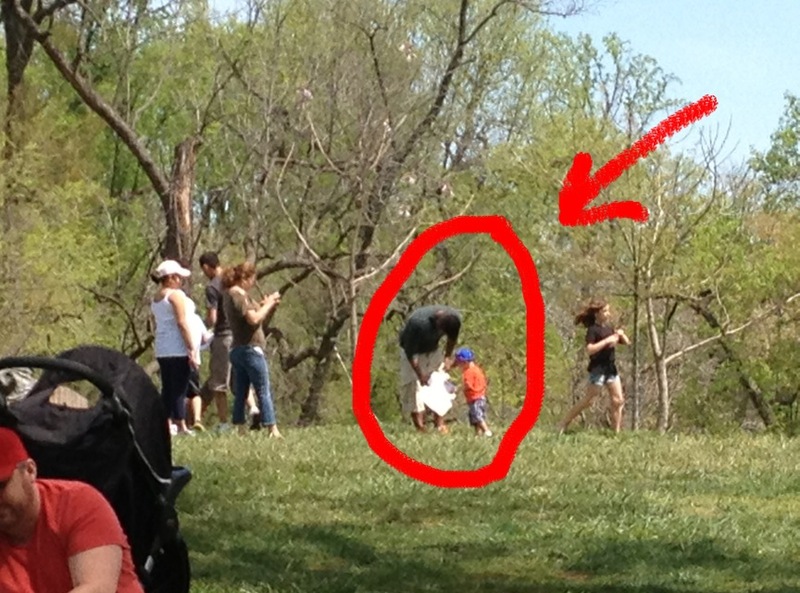 At this point, I was starting to wonder if we would even MAKE it to Maymont! But make it we did and it was a gorgeous day for exploring the park. We took our time strolling through the gardens, climbing the hills, and reminiscing about all the other memories we’ve shared here throughout the years. One of our favorite places to visit is the Japanese Gardens with their unique landscaping. The kids love to skip over the stepping stones and cross the wooden bridges. 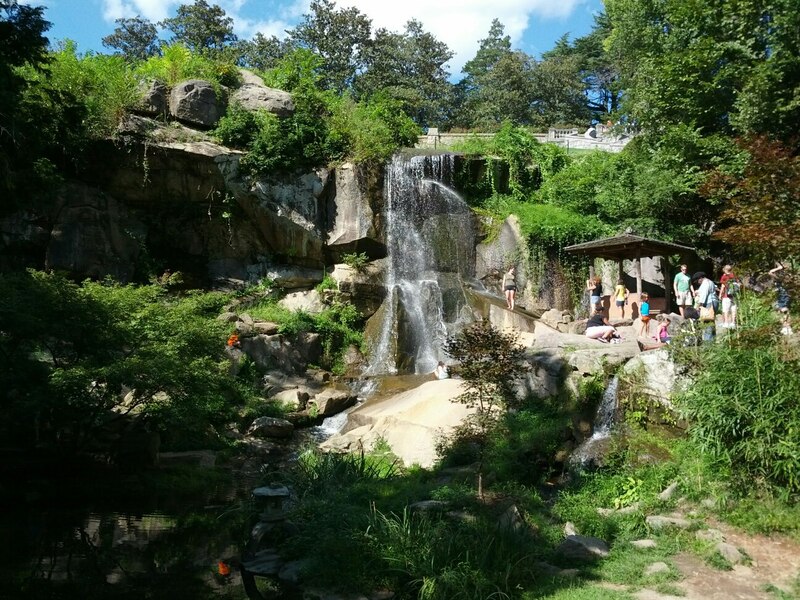 In warmer weather there is an active waterfall, so we were delighted to see it this day. I then told them about my 40th Birthday Project and how taking their photo was another random act of kindness I was doing to celebrate my 40th bithday. I asked for their permission to post photos and tell their story and that’s when the woman told me THE. MOST. EXCITING. NEWS!!!! WHAT?!?!?! I was estatic! I was the very first person to take a photo of this couple, a mere 20 minutes after he proposed to her during a picnic lunch on the very same hill my children and I had climbed to get to this exact location! I couldn’t believe it! How exciting! So I gleefully replied, “Well, show me the RING!!! I want to see the ring! !” The ring was gorgeous (as all engagement rings are), and I ended up taking more photos of the couple, even a few of the ring, too. Timing is everything. Had we rushed out of the house, or not shopped at Target, or spent even 3 minutes longer climbing that hill, I would have missed capturing this sweet moment for this couple. Sure, someone else would have come along and probably taken their picture. But would they have taken half a dozen photos? 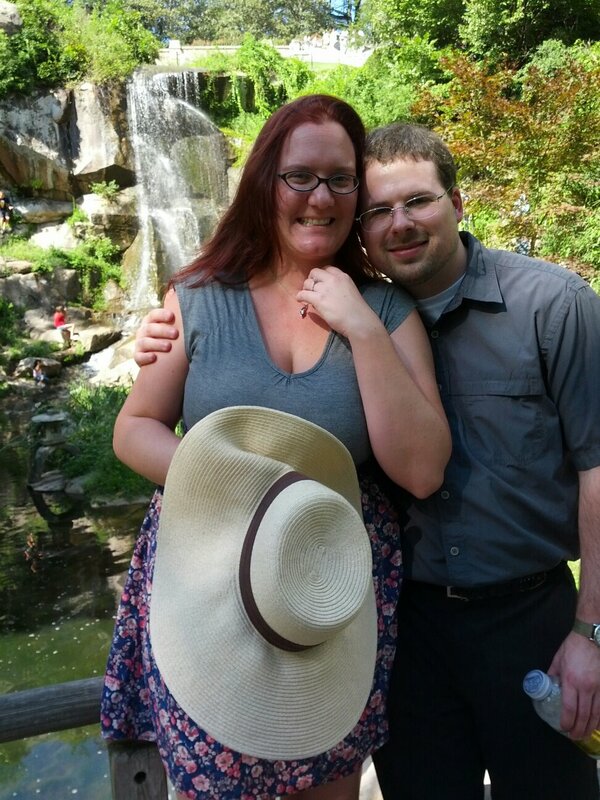 Or positioned the couple to show the waterfall… from their ENGAGEMENT DAY?!? 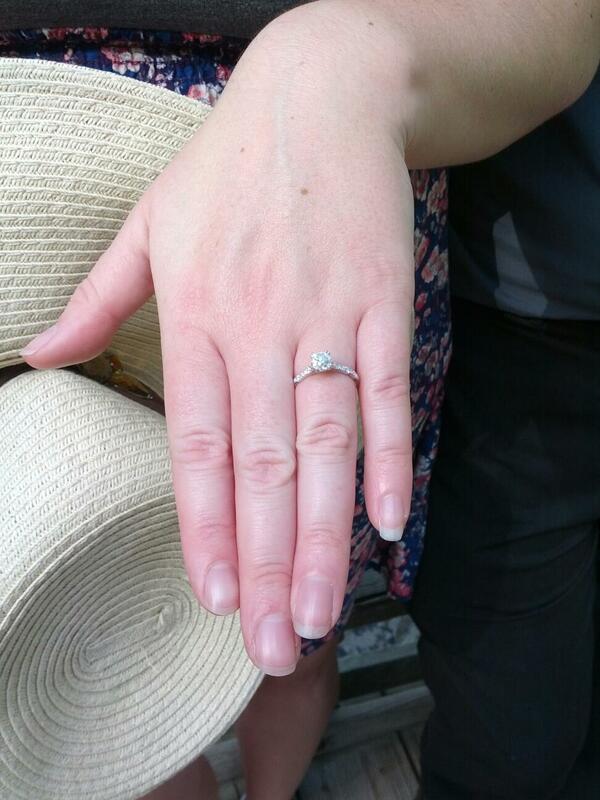 Or captured the sparkle from the delicate diamond ring now gracing the fingers of this very happy lady? I am still smiling thinking about the moment. 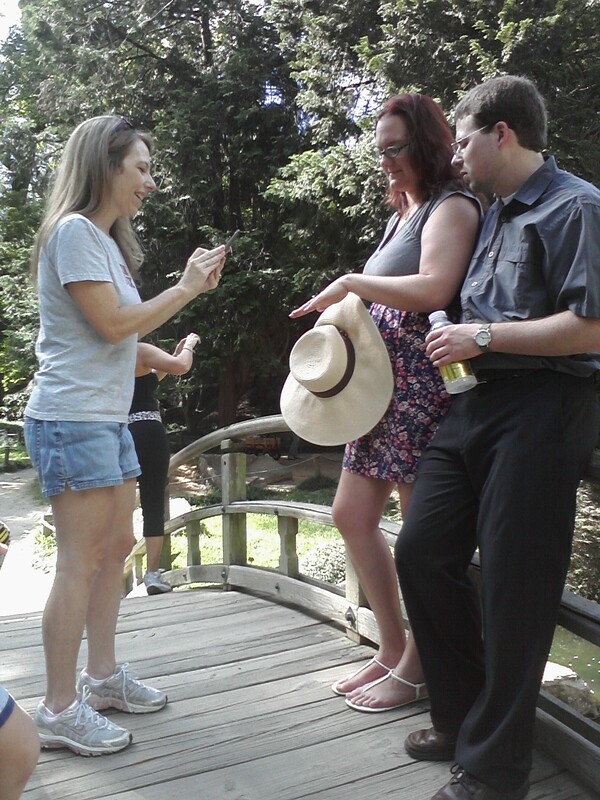 How romantic – a park proposal! And I got to share in the joy simply from being in the right place at the right time. Congratulations to Amy and Alex on their engagement and a special thanks to them for emailing me the pictures I took with their camera so I could add their story to my blog. Today’s post is dedicated to my favorite photographers, Lisa Zader (www.capturedbythelens.com) and Stephanie Toll/James Lee (www.88lovestories.com) who understand the beauty in being THERE to capture a memory. Have you ever spent time standing in the rain? How about being STUCK standing in the rain? In a line? Without an umbrella? Not the most pleasant of experiences for sure. Especially when you are doing this with children. Ugh! On a recent trip to a local amusement park, this was the scenario. A thunderstorm had popped up, catching many guests by surprise. Actually, that’s not really an accurate description. 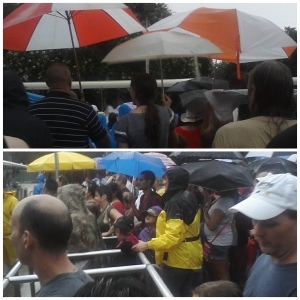 It was more like a torrential downpour from a monsoon that had swept over the entire park. My daughter and I tried to wait out the storm under a sheltered canopy, but there was no end in sight. Realizing the rides would be closed for quite a while (possibly for the rest of the evening), we made the decision to head home. Apparently everyone else had the same idea. It took us almost 30 minutes just to make our way back to the entrance of the park. Luckily, we had umbrellas, so it was more of an inconvenience than anything else. As we stood in line, patiently waiting for our turn to board a tram to our car, I noticed a woman about my age standing near me, shivering, no umbrella, no jacket, no hat, just a thin t-shirt and shorts. She was DRENCHED! She literally had water dripping off her face, her purse, her clothes… and she wasn’t alone. Two children, both young girls, stood close to her, also shivering in the wet rain. Am I sure?!? The question seemed so absurd. Here I am with my daughter, two umbrellas for the two of us, and you are standing there with three bodies total and no umbrella. Yes. I AM SURE!! Even though she was already soaking wet, there was no need for her (and her children) to suffer more. It was such a small act of kindness, I almost hesitated to write this post today. But you know what? No act of kindness is too small. You never know how much your thoughtfulness could impact another person. Whether it be an umbrella in a rainstorm, a thoughtful text to say Good Luck or even just a smile to a stranger… Small acts of kindness make a difference, too.